Washington Ave., in Endicott, receives a lot of sighs, tongue clicks, and shaken heads. "It's not like it once was," they exclaim. Ordinarily, I like to take on these dooms dayers, arguing about gentrification and about how one good shop or restaurant can revitalize most neighborhoods. But Washington Ave., seemingly, is a hopeless case. Walking back to our office last year, a colleague and I came face to face with a man who, minutes after we encountered him, stabbed several people on the other side of the street. It is rough here! On a street like this, a smiling face can go a long way. 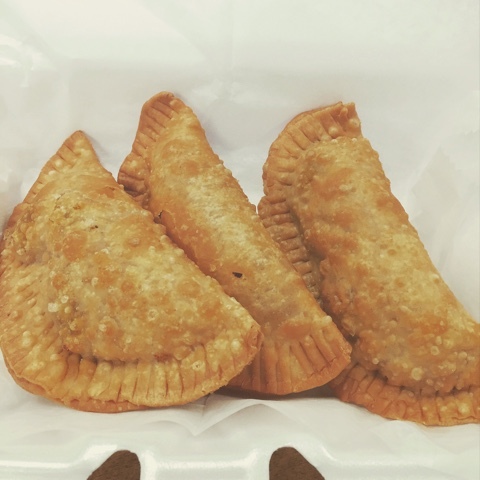 So walk on in to Khan's Kitchen, right on the corner of the Ave and North St., for a big, bright smile from the owner and cook. This cafe opened in the early spring, serving up beyond generous portions of mostly Mediterranean and American eats, but really, the menu is remarkably diverse. 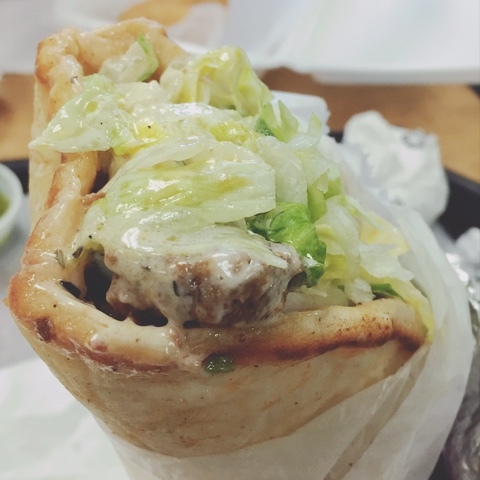 Looking for a great gyro? Khan's has it, handed over with a wide smile and low price tag. The meat is halal, too. My favorite dishes are the chicken tikka, which is highly seasoned (but not spicy) tandoor chicken, tender and flavorful, served over absolutely delicious long grain brown rice seasoned with cumin and aromatics like onions and green bell peppers, doused in a mild and supremely savory "hot" sauce and a light, thin tzatziki sauce that has less cucumber and garlic flavor than most - I'm guessing it's just yogurt, olive oil, dill or thyme and maybe a little cumin? I haven't been able to fully diagram every flavor, but it's saucy and provides a cool, lightly creamy balance with a hint of sharpness to the chicken and rice. 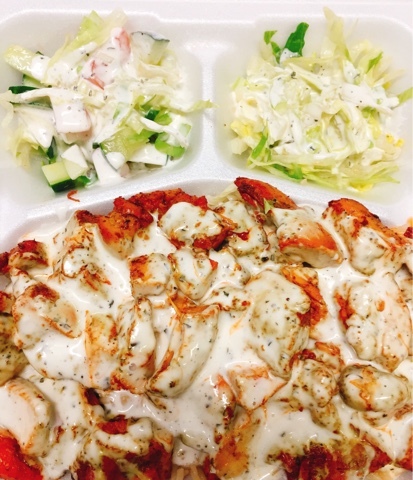 Diced tomatoes, cucumbers, peppers and lettuce doused in more tzatziki provides lightness that I like to sprinkle all over the nearly three-cup serving of chicken and rice. That entire container of food is $7. And here's what's messed up: I have actually eaten it ALL for lunch, in one sitting, because it's so good, but also because I am a monster who doesn't possess a shred of self-control. Rowr. 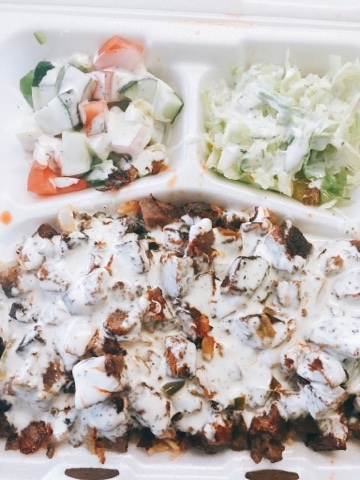 My other fave is the lamb rice, which is the same salad, same rice, same sauces, but with a layer of savory, deep and rich lamb gyro meat right in the middle. The lamb is saltier than the chicken, so the feeling of this one is a little heavier. It's delicious, but you'll be thirsty later. Get it anyway. Khan's also has burgers, fish and chips, and spring rolls, but I haven't worked through the whole menu yet. I'm kind of stuck on that wonderful chicken tikka. My coworker Carrie and I always feel bad that the owner isn't charging more for his plentiful food! This place has been getting steadily busier each week we visit, as people catch on, and rightly so. The dining room is bare bones, the wall color and sparse decor leftovers from Get Forked, the short-lived sandwich shop that used to haunt this space. But we love it anyway. 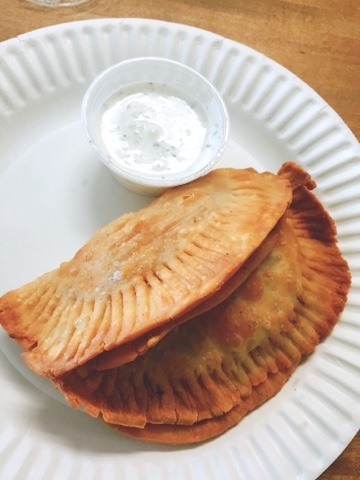 I give Khan's Kitchen a seven on the big hungry scale, and if you have just $7, you've got lunch and an experience that will redeem your belief in Washington Ave.! Have you joined the Big Hungry Shelby Facebook group yet? Well, why not? I'm serving up extra helping of local and national food news and events over there, so join the feast today! My personality is big; my hunger is bigger!